This is the window of Room . For a description of the buttons please scroll down. Window of basic data in the Room menu. In this window, the rooms which are not classrooms are set up. Here you to specify which subjects should be taught in that room. Here you can specify when the rooms are not available (restrictions) or which class and teacher are to be given priority to the room. This button will allow you to move to previous room. This button will allow you to move to next room. 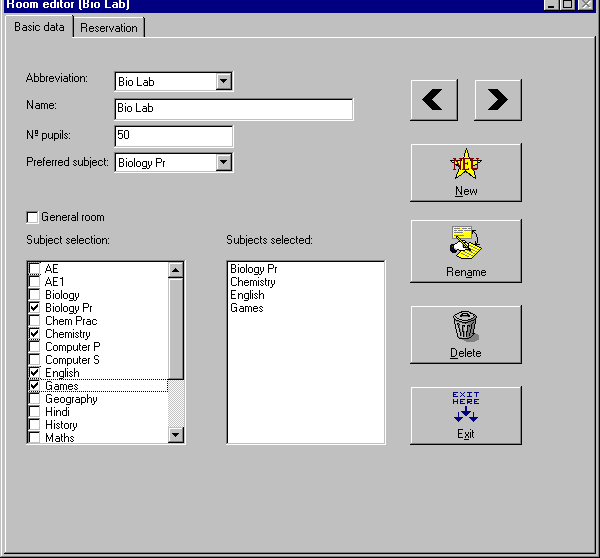 This button is used to create a new room & assign the subjects to that room. This button will allow you to rename a room. This button is used to delete a room. This will exit from the room editor window & return to Main Screen of TURBO Planner.